Last week I wrote about Constraint Induced Movement Therapy or CIMT. This photo from the Children’s Hemiplegia and Stroke Association (www.chasa.org) is the best example that I have seen. The boy is fully involved in the task, using his affected hand. Even in a child with a very functional hand, this type of wrist weakness leads to poor writing and typing speed that only really becomes evident in the teen years when the academic demands go up. This wrist position, in less functional hands, adds to the difficulty of learning any fine motor task. Yet most children do not have either support or specific wrist strengthening exercises as part of their therapy and home programs. I do not understand this approach! There are only 2 explanations that I have been able to come up with to this point. The first I mentioned last week. It is my experience that many therapists who work in either an Early Intervention Program or a Pre-School Program do not understand the peak periods of hand neuroplasticity and how hand use changes over time. They are fooled into thinking that braces and splints are not needed because the hands show a lot of improvement over the first few years. The second reason is a failure to treat with the expectation of improvement over time. Baby brains have a lot of neuroplasticity and the process of recovery from an early brain injury starts early and lasts 3 to 4 years, just as an adult recovers from stroke over the same time period. The key point is that we should expect more recovery in the baby brain, as it is more plastic than an old deteriorating brain. A baby with a brachial plexus injury also has a good chance of early recovery. As a child develops the characteristic patterns of cerebral palsy, there is a recognizable series of changes in the affected hand(s). Most babies start out with a gently fisted hand that gradually opens more over the first couple of months. Babies with brain damage often have a fisted hand that lasts longer and gets tighter with movement. Children with a mild injury may only have “activity dependent tone” as they learn to move against gravity. Over the next 3 to 4 years, as the brain injury recovers to whatever extent it can, the child learns that one hand works better than the other and starts to favor the more functional hand. This process is worse in children with BPI. (Developmental Apraxia Complicates BPI Recovery) Studies with early CIMT have shown that children with a persistently fisted hand do not respond. But here is the key point. Some of these non-responding children do very well with a second CIMT period when they are 4 to 6 years of age. The answer lies in the brain! Children’s hand function improves between 4 to 6 years as their cerebellum matures and becomes functional. The cerebellum is very immature at birth, with primitive neuroblasts still migrating to their final position over the first 2 years. The next stage is for the neuroblasts to first differentiate into specialized nerve cells and then to connect up with each other and the rest of the brain. One of the main functions of the cerebellum is to assist in fine motor skills. For the child with hemiplegia or quadriplegia, this later developing part of the brain acts as a useful back-up system that results in improved function. Just like the children who respond to CIMT differently at different ages, in my experience, every hand shows improvement at 4 to 6 years. Another part of the problem is the child’s willingness and/or ability to use the affected hand. If therapy was focused on trying to get the child to learn fine motor tasks for the first 4 years, the child has failed. Most become quite resistant to being pushed to use a hand that does not work as well as the preferred hand. Most toddlers know one hand works better than the other, so why not support the affected hand and wrist in an appropriate splint and teach the child to use it as a “helper hand”. Inventive therapists can find all sorts of ways to encourage bimanual skills that keep the affected side in awareness. Then, when the fingers relax out, the child will happily learn to use it more. My son was born last year in July and is now just over 8 months old. He suffered hypebilirubinemia and as a result is suffering with kernicterus. We have already purchased the spio to help with his back and neck control. I am quite concerned about his hands. 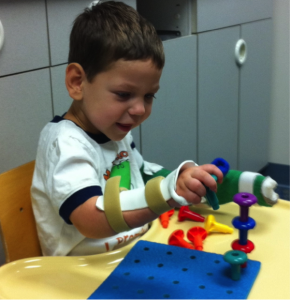 He is only 8 months old, and have seen a product called the Mckie splints. Do you think we should invest in these immediately? Thank you. Thank you for your comment. I would I would take take this information to your therapist and see if they think it would help. I have been very happy with the results with the McKie splints, but it does depend on being properly fitted. Fortunately, the company has a very good sizing chart and are responsive to any questions.